KaOS is focused on being a lean KDE distribution that is "a tightly integrated rolling and transparent distribution for the modern desktop, build from scratch with a very specific focus. As you have read in the last post, some funny things happen in the Cafè group of w2l; there are some other nice stories which deserve to be telled, but the one’s I’m going to talk about is different from the others. If you have read some of my post you would have understood I’m not mentally sane. Okay, no debate about this, please. В США на 75-м году жизни скончался изобретатель электронной почты Рэй Томлинсон. Причиной смерти стал инфаркт. Leader in intelligent traffic systems chooses the QNX Neutrino OS for its ACTROS family of traffic light controllers. Nuremburg, Embedded World 2016, Hall 4, Booth 534 mdash; February 23 mdash; QNX Software Systems Limited, a subsidiary of BlackBerry Limited, today announced that SWARCO TRAFFIC SYSTEMS GmbH has chosen the QNXreg; Neutrinoreg; Realtime OS for its ACTROS family of traffic light controllers. ACTROS controllers bring an intelligent approach to managing urban traffic. They are designed to enhance safety, optimize the use of existing road infrastructure, and improve traffic flow to minimize carbon emissions. The product family includes ACTROS.compact, an energy-efficient device for smaller intersections and pedestrian crossings, and ACTROS.alpha, a scalable solution that can handle complex, multi-lane intersections with massive volumes of traffic. My name is Vincenzo Eduardo Padulano, I’m a student in physics at Milano-Bicocca University. All my life I’ve been curious about the universe, the unexplored and the unknown. Above all, my interest was in finding new ways of improving our species’ adaptive skills against what is yet to come, and there’s no better way than uniting our efforts against it. No wonder then, that when I was contacted by Riccardo Iaconelli in late September 2015, I swiftly join the project WikiToLearn. Briefly, WikiToLearn is a website that aims to create an online library where everybody in the world should be able to acquire every kind of knowledge, and help to improve the existing one. in fact, the motto of the project is “knowledge only grows when shared”: this means that not only everyone can learn from the content of the site, but furthermore everybody is crucial to its upgrading! Фредерик Кулот представил первые результаты по созданию псевдографического интерфейса для pkg — пакетного менеджера FreeBSD. Интерфейс состоит из двух панелей: на одной отображается список доступных пакетов, на второй — подробная информация о выбранном пакете. На данный момент portal предоставляет базовый функционал: установка, удаление, поиск и фильтрация пакетов. Для нормального отображения требуется поддержка кодировки UTF-8 в терминале и шрифт с большим набором unicode-символов (например, DejaVu). Если данные условия не выполнимы, можно воспользоваться ключом -a для использования ASCII-символов. В модуле Linux snd-usbmidi-lib обнаружена уязвимость, из-за которой стало возможно запустить код с правами ядра при наличии у злоумышленника физического доступа к компьютеру. Для успешной атаки нужно подключить специальное USB-устройство, которое передаст некорректные параметры USB, и запустить эксплоит из-под непривилегированного пользователя. Уязвимости подвержены ядра в большинстве дистрибутивов, проблема исправлена в 4.5-rc4. Также проблему можно решить отключив модуль ядра usb-audio. I was planning to create a keyboard shortcut for this, but Johan Ouwerkerk had a better idea - that I should make the activity switcher behave like the window switcher (the Alt+Tab thingie) - that the activities should not be alphabetical, but that the most recent ones should go first. This way, switching to the previous activity is just a single Meta+Tab away. Now, while the above is the main announcement, I also wanted to mention a tiny change to the Meta+Tab activity switching. Tiny, but important - as people say “the devil is in the detail”. You might have noticed that for some time now, the activity switcher is showing when was the last time you used a particular activity. This information was useful, but not for the people who switch activities with Meta+Tab. GSoC 2016 Project Survey, help me make Dolphin a better File Manager! I am a first year computer science undergraduate from BITS Pilani, Hyderabad Campus. I am looking forward to working for KDE for the GSoC. My project idea is based on solving a problem all file managers have had for years - the lack of an easy to use file selection tool. My project aims to simplify selecting files from multiple directory trees. I am running a survey to gauge community feedback on my idea and to finalize the user interface and features list. Спустя несколько лет после официального открытия исходников минималистичной 2D и 3D САПР SolveSpace v2.0, изначально работающей только на Windows, силами сообщества был создан форк SolveSpace v2.1, портированный также на GNU/Linux и OS X. Кроме того было внесено много улучшений и добавлено несколько новых форматов экспорта и инструментов для работы с чертежами и моделями. Recently the question was asked in the KDE forums how we handle advanced settings. While there is neither a best practice nor a common approach in KDE software, we actually discussed a similar concept in respect to the Plasma control modules (KCM). The updated organization of KCMs was implemented by the developers, the community decided about the basic layout, and a couple of proposals were done [1, 2]. So why don't generalize this idea and write a guideline? После трех лет разработки вышла Mixxx 2.0 — программа для «диджеинга» (сведения музыкальных композиций в реальном времени) с открытым исходным кодом. Разработчики решили, что изменения со времен 1.11 достойны инкремента мажорной версии, и пропустили версию 1.12. Изменений действительно много, однако с большей частью новой функциональности можно было ознакомиться по бета-версиям 1.12. As expected, Calligra 2.9.11 is only a bugfix release, and it is here to improve the overall performance and compatibility of the office suite used by numerous GNU/Linux users on their KDE desktop environments. Just a small update on the Call for Speakers for the OpenStack Austin summit. The submission period was extended. The new deadline is February 2nd, 2016,11:59 PM PST (February 3rd, 8:59 CEST). You can find more information about the submission and speaker selection process here. 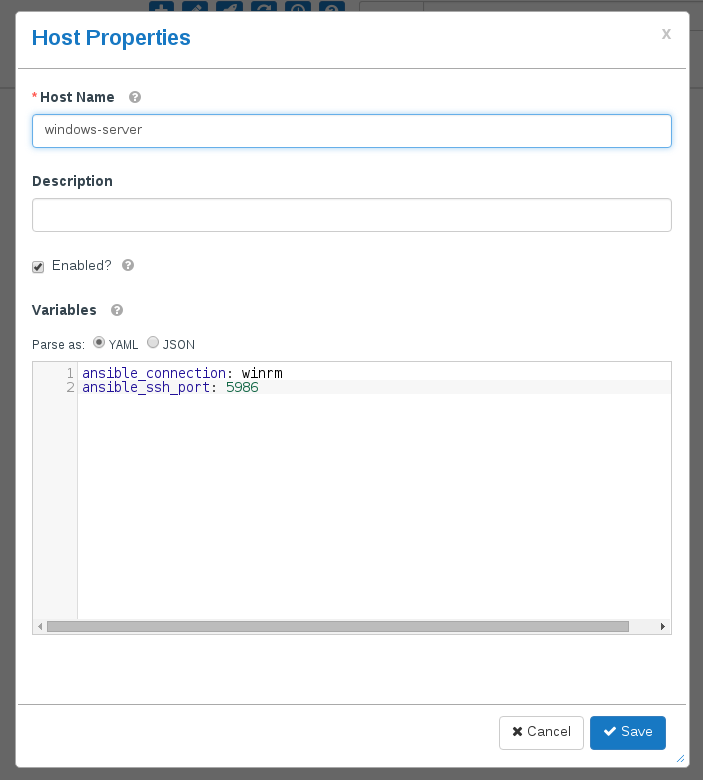 The given screenshot shows the variables for Ansible 1.9. For 2.0 and above the variables are a bit different. Also, keep in mind that you might need to create an additional set of credentials. Поддержка синтаксиса форматирования названий треков (title formatting) из foobar2000. Поддержка mpg123 в качестве библиотеки декодирования MP3 (есть возможность выбора между mpg123 и libmad в настройках). Добавлен плагин для проигрывания музыки Atari ST (SC68). Добавлен виджет для организации собственных вкладок в режиме дизайна интерфейса. Поддержка записи информации ReplayGain в различные форматы тэгов (плагин сканирования пока не предоставляется штатно, но может быть установлен отдельно). Обновлены библиотеки GME и DUMB, с добавлением новых возможностей и оптимизаций. Улучшена поддержка проигрывания аудио дисков. Множество других улучшений и исправлений практически во всех областях плеера. When the streets are covered with snow and ice in many parts of Europe, it’s a good time to sit inside in front of our computers and to improve that software we are sharing here with each other. With the porting of the apps, plugins & libs part of Calligra to Qt5/KF5 roughly done towards the end of 2015, it is now also a good time to work on features again. Given a few Calligra developers interested in improving the text-handling modules, we looked into doing a developer meeting (a.k.a. “sprint”) on that quickly, and given January being a good candidate for snow and ice on the streets, we scheduled it for the 4th week-end of January, so the one that just passed. A big share of time of the sprint was invested into spreading knowledge about the current text-layout system by its architect Camilla, by explaining and discussing the current design and code. Earlier this week, the loved one of a man I used to babysit was pushed into the path of an oncoming subway train car, by a stranger, and soon after died of their injuries. While the death seems random, even cruelly so, it's one of many like it: Every year, people die on Berlin's various railways. Azure Storage Explorer — это утилита, которая позволяет работать с сервисами хранилища в облачной платформе Azure: таблицами (noSQL хранилище), блобами (бинарные объекты) и очередями (передача данных от источника к получателю). В новой версии реализована заявленная ранее поддержка операционных систем семейства Linux (в предыдущей поддерживались только Windows и Mac OS X). Проект разрабатывается под лицензией MIT. Генерация: 0.229 сек. и 40 запросов к базе данных за 0.127 сек.